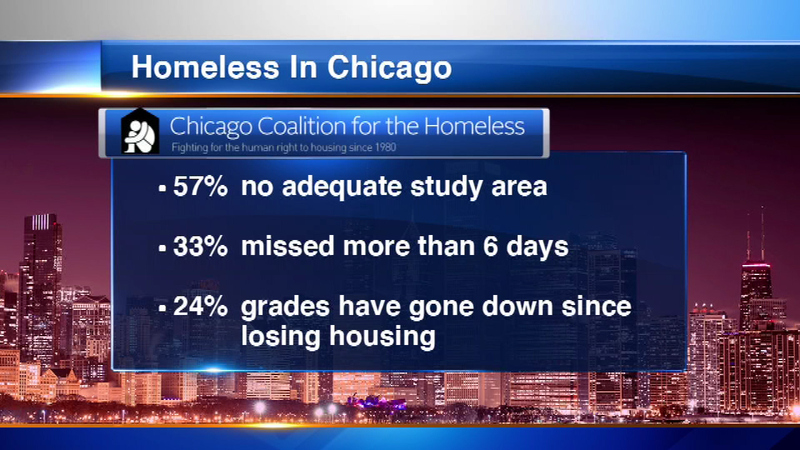 There are 20,205 children in the Chicago Public School system that are homeless, according to a new study done by the Chicago Coalition for the Homeless. CHICAGO (WLS) -- There are 20,205 children in the Chicago Public School system that are homeless, according to a new study done by the Chicago Coalition for the Homeless. The study will be released on Wednesday, but Eyewitness News obtained some details on Tuesday. Most of those identified as homeless move frequently, often from shelters to homes of friends or family. - 56 percent say their children do not have adequate study areas. - 33 percent say their children missed six or more school days last year. - 24 percent say their children's grades have gone down since the family became homeless.